The armature reaction is nothing but the effect of flux produced by armature conductors on the distribution of main flux due to the field poles. In case of all the d.c. machines it can be seen that armature m.m.f. is approximated by a symmetrical triangular waveforme with axis as interpolar axis. Thus armature m.m.f. and field m.m.f. are displaced in space by 90o. This will cause distortion in main field flux which is called cross magnetising effect of armature reaction. The armature m.m.f. lags behind field m.m.f. with respect to the direction of rotation in case of motors and vice versa in case of generatos. The Fig. 1 shows the developed form indicating distribution of main field flux, armature flux and the respective m.m.f.s The armature m.m.f. is zero at the pole centers and maximum at interpolar axis. Assuming air gap to be uniform then the distribution of flux due to armature current only is shown in Fig. 1(c). It is observed that flux density in the interpolar region is very large owing to large reluctance offered by long air paths in this region. The flux density distribution due to main field poles is shown in Fig. 1(b). The total flux in air gap is due to resultant of the field and armature m.m.f.s Thus resultant flux density can be found by adding the two flux density curves shown in the Fig. 1. 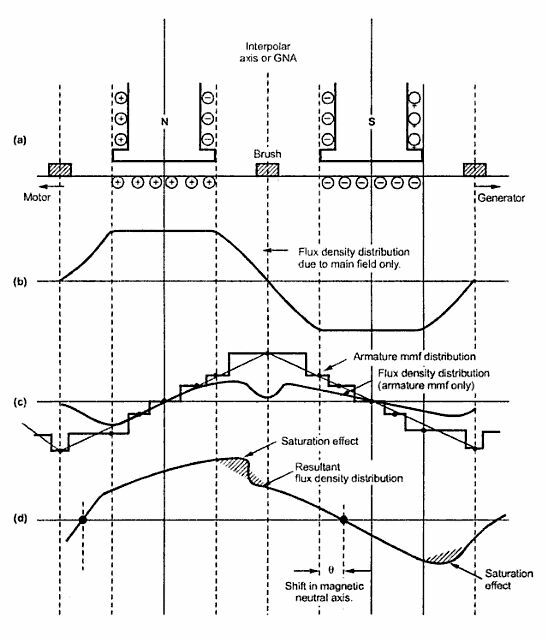 The resultant flux density curve is shown in Fig. 1(d). Thus armature reaction will cause distortion in in main field flux density distribution curve. The MNA will be shifted by some angle. So the brushes are also shifted same angle as they lie along MNA. In case of motors it is observed that the brushes are shifted backwards opposite to the direction of rotation. So that they will lie along MNA. If the excitation to the main pole is provided in such a manner that iron is n the saturated region of magnetization, the increase in flux density at one end of poles caused by armature reaction is less than the decrease at the other end. This will cause a net reduction in the flux/pole. This is nothing but demagnetising effect of armature reaction. One of the important effects of armature reaction is delayed commutation as the current in the coil undergoing commutation tries to maintain in the same direction. Thus armature reaction at the brush axis must be neutralized. This is achieved by using interpoles. 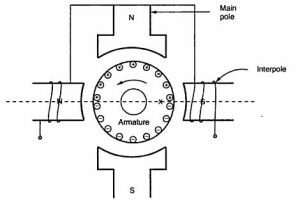 In the case of motors, due to armature reaction a field is produced at geometric neutral axis which has same nature as the pole ahead of it. 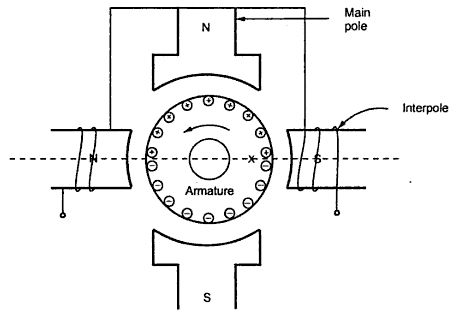 Thus interpole must produce a field corresponding to main pole behind it so that armature reaction is neutralized. In the Fig. 2 the coils undergo commutation along the axis at X shown. Due to armature reaction, the MNA is shifted behind this axis and develops a field corresponding to north pole which is the main pole ahead of it. Thus it is required to produce zero field at at X which is done with the help of interpole whose m.m.f. is equal and opposite to that of armature m.m.f.. Thus interpole must develop south polarity which is main pole behind of it. To neutralize the effect of armature reaction at all loads the interpole winding is connected in series with armature. Why Series Motor Is Never Started On No Load?